So I recently began my first attempt at sewing a chevron design quilt. Let me tell you, for this self-taught, improv style quilter, this experience has been a reality check! I love trying new-to-me techniques and getting out of my quilting comfort zone every now and then. But when it starts to feel like a giant mess of mismatched seams…. Grrrr! Let’s just say it’s a great thing that my life does NOT depend on having a matching seam because I fear if it did, I would surely be dead! I know what many of you are thinking- “huh? this is one of the most basic of piecing techniques-what’s the problem?” Right? That’s exactly what I was thinking too. I could blame it on the linen, but I could only get the seams to match about half the time even when I was piecing the cotton. I know my cutting was precise, my 1/4 inch seam is solid and consistent, my pressing was good(although maybe all seams should have been pressed open? )– so what gives? Now, just so I don’t lose all my quilting credibility with you, there are plenty of seams in this quilt top that do line up just right- wheww! In the end, I like the design enough to continue with the quilt top and complete the piece. 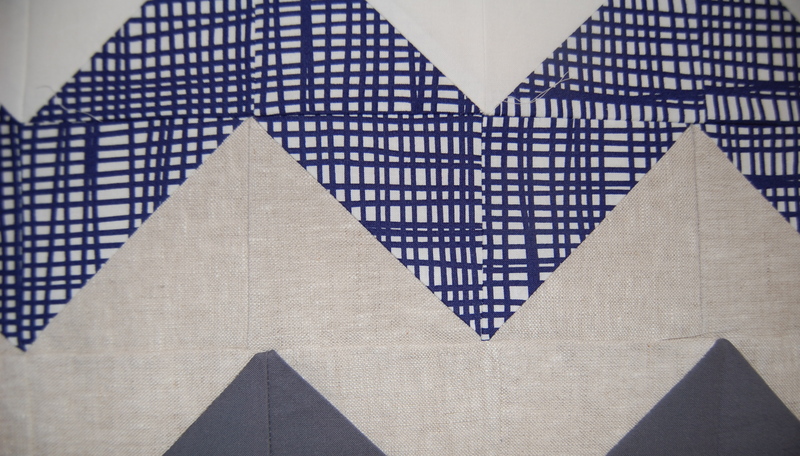 I realize that these little “flaws” can add character to a quilt and they are definitely not worth stressing out over. 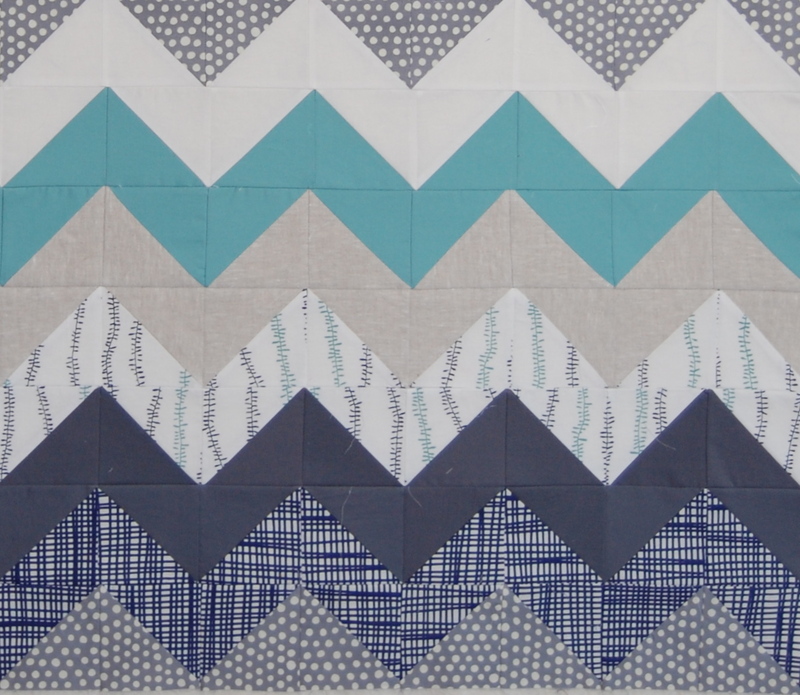 I will though, look into alternative methods of sewing a chevron design quilt. I know there are many out there. And of course I’ll practice this method some more, do a little trouble shooting, etc. It never hurts to improve ones skills-yes? Have you run into any new quilting challenges lately? I welcome them as a chance to learn– even if they do make me just a little bit crazy!! 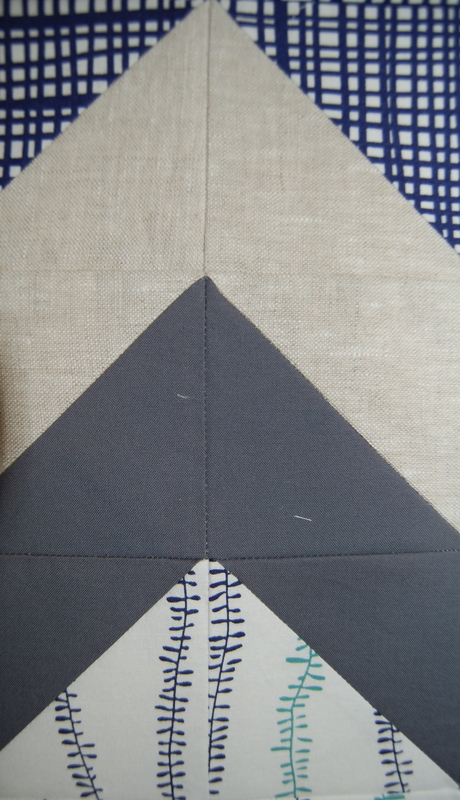 I’m linking up with Freshly Pieced Work in Progress Wednesday. There are lots of great works to be seen over there! I am with you on the whole matching seams mystery!! But I live by the “if you cant notice the error when you are riding past on a horse,….it doesn’t matter! !” …and that makes me happy! Ha!! That make me happy too, I love it!! I may have to quote you on that someday- do you mind? Lol that quote is awesome! P.s I think the quilt looks amazing!!!! Only the quilt police are looking for mismatched seams, so take heart, you’ve got a lovely quilt! Oh my – I love this Karen. What an incredible piece of art, design, talent, hard work, creativeness, and a beautiful quilt. Just love it. Ya know what? I’ve sewn quilts where just about every seam matched up perfectly, then the next quilt I do everything is all over the place. LOL I just finished a chevron a few weeks ago and it’s far from perfect… 😛 I love the colors you chose! Oh my gosh that is so beautiful. What a great job you did. This looks fantastic! I wouldn’t even notice that some of the points don’t quite match if you hadn’t pointed that out, and seriously who doesn’t have a few that get a little off now and then? 🙂 I find that heavy starch really helps me to keep my HSTs in line, especially with linen. Since it has a looser weave than cotton, it is more apt to stretch out of shape. I am really liking what I am seeing. This might have to be another one of your freally fantastic mistakes! LOL!!! 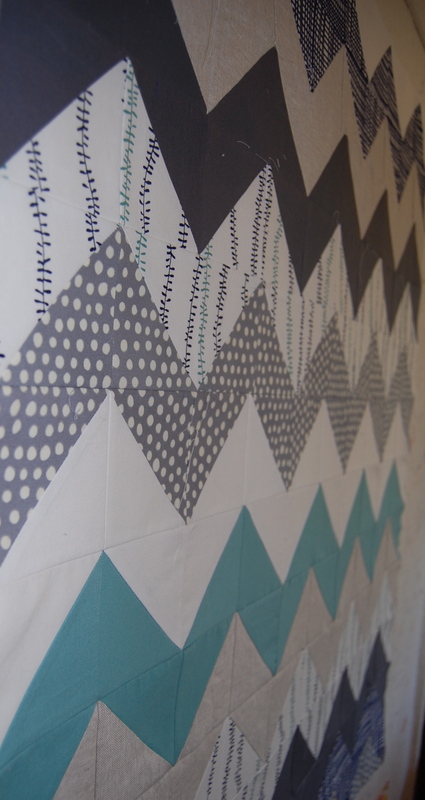 Check out Amanda Jean’s Zigzag quilt tutorial at Crazy Mom Quilts. No triangles to mismatch! I made it and it went together like a dream. 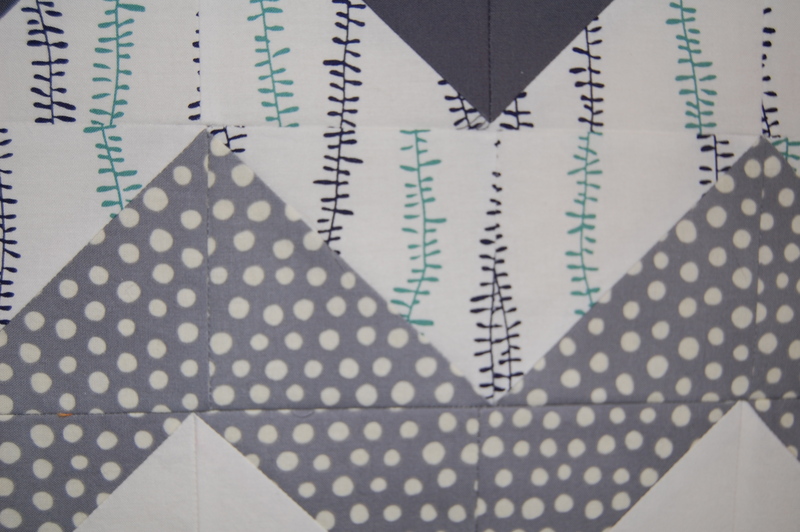 I’m not a quilter, just happened upon your blog while searching for something else, but I love it. Love the colors the patterns, everything. The imperfections just show it was made by hand with love!